"Ice-class tanker "Timofey Guzhenko" is the third ship of reinforced ice class tankers destined for the marine transportation of oil in the framework of the Arctic energy project "Varandey". 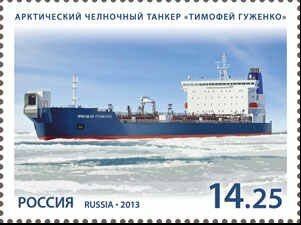 The tanker was accepted into service on 24 February 2009 and already in spring began the regular shipments of crude oil from the terminal Varandey to the port of Murmansk. It is equipped with a system of sensors and measuring devices allowing to monitor the condition of the ship’s body, machinery and systems while operating in the ice and at low temperatures.